I cry a lot. I get it from my Grandpa. He used to cry at Naked Gun movies. I cry when I watch Parenthood on NBC, when Duchess tells me she loves me, when Duchess accidentally knees me in my man bits, and sometimes because of the internet. Today it was the internet. Someone asked me awhile ago: If the internet had a slogan, what would it be? I immediately replied that the internet's tagline should be "Far better and far worse than you could ever imagine." Thankfully today is far better day. And that link led to this comment from two years ago. I'm cutting off the image there and reprinting the comment in full for you to read. Because you need to read it. Because it made me cry in the middle of a fast food restaurant. Oh and one warning... I didn't change it at all, so there are some curse words. In the 5 months since I have changed a couple of tires, given a few rides to gas stations and, once, went 50 miles out of my way to get a girl to an airport. I won't accept money. Every time I tell them the same thing when we are through: "Today you.... tomorrow me." And then I was wiping the tears away with my napkin. The nice lady who collects the trays asked me if I was ok. I told her yes, handed her the five bucks in my pocket and walked back to work. What a wonderful lunch. Anyway, thanks for indulging my sappy internet story. And thank you internet. You never cease to amaze me. Here is the link about the couple who had their dinner paid for. Here is the comment I reprinted. P.S. I am reprinting this without permission since it was originally posted in a public forum. Rhoner, if you see this and would like to contact me about it for some reason, click the contact me page up top. BTW, thank you. You not only made me a better dad today, you made me a better person. I had a very similar expierence. My cousin and I were driving to Easter dinner with family from LA to Ojai when her tire blew out. We were both dressed in nice clothes as it was Easter, but I sucked it up and was going to change the tire myself. As I was trying to get the first lugnut off, the car somehow fell off of the jack and nearly crushed my leg, and started rolling down the highway (we were on an inclune) because my cousin who was barely 20 at the time had forgotten to set the parking break. Seeing this calamity as they drove by, a car full of Mexican immigrants immediately pulled off the road, backed up nearly 1/2 a mile on the shoulder and got out to help me. In fact, insisting that the father and his son take care of the work so I wouldn't get my clothes dirtier than they already were. My cousin and I eventually got back on the road and were late for dinner, but we made it there because of the kindness of strangers; strangers that may or may not have been here illegally, but had the descency to help somebody else in need when nobody else would. I love knowing that there are good people in the world! Got something in my eye, now, too. I've always been a private, antisocial kind of dude. Rarely stop for others, partly because I don't know car maintenance, partly cause I usually have my daughter with me, and partly because the people always seem to have things taken care of (this is probably some sort of rationalization, I realize). But I DO believe in trying to become a better person, and I'd like to become the kind of person that this story describes. Thanks for sharing. Yeah, well hopefully you're not sitting at a table by yourself in a burger joint! Thanks for the comment Neal! (If other readers are reading these comments, go check out Neal's blog http://raisedbymydaughter.blogspot.com/) It is great! Stories like this restore my faith in humanity. Thanks for sharing it! Right! The things about stories like these is that most of the time I don't know how much faith in humanity I've lost until it all comes rushing back in at once. Love this! Bless your tender heart and humanity's goodness. What a wonderful post! And a great reminder to "pay it forward" (one of my favorite movies!). I was actually once the recipient of a paid maeal at a fancy restaurant. My boyfriend at the time and I ate an expensive dinner meal seaside in Laguna Beach. At the end of the meal, the waiter told us that another dining couple, who had already left, noticed our love for each other and paid for our meal. Blew me away. Anyway, thanks, again, for sharing this reminder. Nice people make me happy! Hey john,I wanted to drop a line to you and let you know that your 'the internet made me cry' blog really spoke to me. I read that whole article and decided that now was the time. The time do what exactly? The time to start acting like a human again. Not that I was a bear or t-rex or a badger, but I was out of touch with humanity. Today, I was driving down the road, taking my son to a mommy and kid breakfast date. I saw a guy, in like 30 degree weather trying to fill his gas tank with a lil 5 gallon gas can. I unfortunately couldn't stop. I felt bad for that guy, felt bad that I couldnt help at that exact moment. When we got to the diner, our waitress looked beat. Like she had worked non stop for months. Im sure she had some kids and was scraping by on a measly waitress 'salary'. I decided it was a 'today you, tomorrow me' kinda opportunity. She was patient and attentive to all of her tables. But she just looked so tired. Ive worked as a waitress and quite simply put, people are greedy, obnoxious rude eaters. My bill came to 15.95. I wrote her a note on a napkin that said, "I was a waitress too once. I know how hard it is. Today you, tomorrow me. Have a great day." And I left her a $20 tip. The bus girl saw me do this and no sooner had I reached the register, she had collected the tip and took it to our waitress. I paid my bill and left. With one final glance back, I saw her read the note, hand on mouth. She was shocked. I could care less if there was recognition for this. I didnt do it for me. But for her. To let her know, randomly, people can still see the look of over worked, under paid, exhaustion, and need. So thanks again for posting this blog. I appreciate all that you do. Brittany, this was the perfect way to start my Friday. Thank you so much for posting it here! If it wasnt for you making this blog, I probably never would have done it in the first place. So thank you, like I said, for being inspiring! Note to everyone else.........doing things like this are a lot easier than you could imagine. It definitely makes you stop and think. So maybe tomorrow it could be you. I too was once the recipient of a paid meal. It was at a chinese fast food type place back east. I was sitting with my husband and toddler at a table, waiting for our turn. There was a man picking up his take out order, and my son was smiling and waving at him the whole time. He smiled and waved back as he walked out the door. We go up to the counter to get our take-out and to pay, only to find the man had left $60 to cover our bill. It was hard to understand the man at the counter, as he had very broken english. By the time we figured it out, and turned to say thank you- the paying man was gone. Although I'm sure that his intention was not to be thanked. 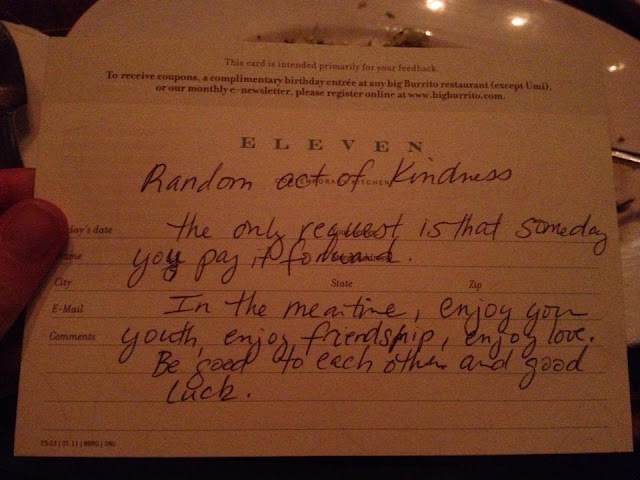 I've done my best to "pay it forward" ever since, and I find it keeps coming back to me- just when I need it the most!! Phew that made my eyes sweat! Thank you for sharing! This made me cry, too. If only there were more people like this in the world! I read this when you originally posted it but decided to read it again when I saw Pregnant Chicken shared it on FB today. I really needed a reminder that there ARE good people out there after what happened in Boston yesterday. Thank you for this post. It has inspired me to help more. In Hawaii, we had the most wonderful waitress three nights as my family and I went out to dinner. She had a beautiful puka shell necklace on. I told her it was lovely and several minutes later, she came back and gave it to me. I felt so freakin' guilty... had my comment somehow made he give me her necklace? I thanked her profusely but told her I couldn't accept. Her we are on an extravagant Hawaiian holiday and our server is giving me a gift?!? She wouldn't accept it back though. I didn't know how to thank her so I told her that I wanted to take a photo with her and my family. She only asked that I email her a copy. Her kindness and generosity brought a tear to my eye. I wanted to gift her something but I didn't have anything with me and we were headed home the next morning. My husband told me later though that he silently gave her a $100 tip that she would find once we left. I'm so, so glad and I hope that made her day 'cause I sure know her gift made mine! There was an incident in the small town where I live that both reaffirmed my hope in humanity, and at the same time, crashed it to pieces. A homeless man was on the corner, asking for money with the cardboard sign. A young woman went to a nearby restaurant and bought him a full meal, a case of water, a large soda and a small coffee, along with a coat (it was late winter/early spring - we live 2 1/2 hrs northeast of SLC). She waited a little bit, watching him. As I watched her to see what happened. She gave him all the goods, and left. That was it. I smiled, happy because my daughter saw the exchange. But I remember most what she did. She drove a crappy little car, her clothes weren't high fashion. Her decal said she was in school. Yet she managed to get enough together to help someone else. That is what I choose to remember. the comment 'I didnt do it because my kids were with me' That is exactly when you should do it. how do we teach out kids if not by showing them. some things are more important than the really important appointment. sometimes its more important to be a decent human being, and to show our kids how to do that. I love your internet slogan - so true. Great story you shared. I can see why you cried. It's moving to hear when people are good to each other. It makes me hope I can do something similar.